The main complaint my friends and I have about the iPad keyboard is that there is no apostrophe key on the main keyboard. Colleagues tell me AutoCorrect will add it in, but it doesn't always work. Those composers who frequently use the words “she’ll” and “won’t” have to add in the apostrophe manually. In addition, AutoCorrect will also add an apostrophe to “were" making one have to go and remove it to have a composition make sense. When I’m typing, I also find myself on new lines because out of habit, I hit the return key when all I want is an apostrophe. 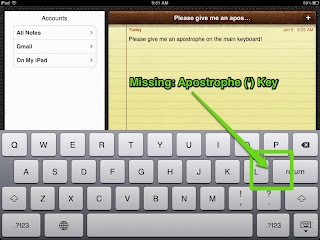 There is the shortcut to hold the (!,) key for a while and the apostrophe will eventually appear. I don't what to stop and wait. 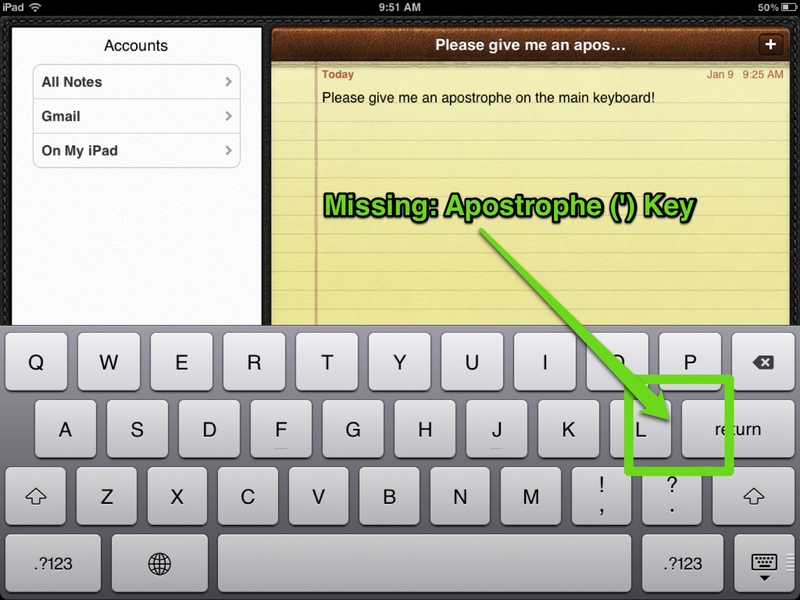 So dear Apple and iPad creators, please put the apostrophe back on the main keyboard. Thank you.